HomeNews ArticlesWhat is a Guardian Warm Roof Conservatory? What is a Guardian Warm Roof Conservatory? Our Guardian Warm Roof Conservatories are an extremely popular choice with our clients. However, many customers are unaware of this conservatory until they meet with us. You may be wondering what a Guardian Warm Roof Conservatory is – let’s take a look! We install a great range of conservatories and orangeries here at Sheerwater Glass. Sometimes our clients know exactly what they want (or at least they think they do) or they have no clue, but what we like most is that we can broaden their horizons with other options. You can always guarantee an immaculate conservatory design with us, but with a range of options available, it’s important you pick the right one for you. There are many options available on the market and choosing the right one for you relies on several factors. Whether you’re choosing your conservatory based on budget, aesthetics, design configurations, performance, or something entirely different, it’s vital that you consider all options. If it’s quality, thermal efficiency and customisation that you’re looking for with your conservatory, then the Guardian Warm Roof is a fine addition to any style and shape of conservatory. What is a Guardian Warm Roof? A Guardian Warm Roof is a solid roof for conservatories and is widely known for its affordability and efficiency. The Guardian Warm Roof is described as “a revolutionary step forward in home improvement,” and no wonder, it provides brilliant thermal efficiency and provides you with a range of design options. We’re a trusted installer of Guardian Warm Roofs. With Sheerwater Glass, you can easily replace or construct your conservatory roof with a solid warm roof system. Since 2010, legislation has changed to allow the installation of solid roof systems for conservatories in the UK, so there are minimal building control implications. 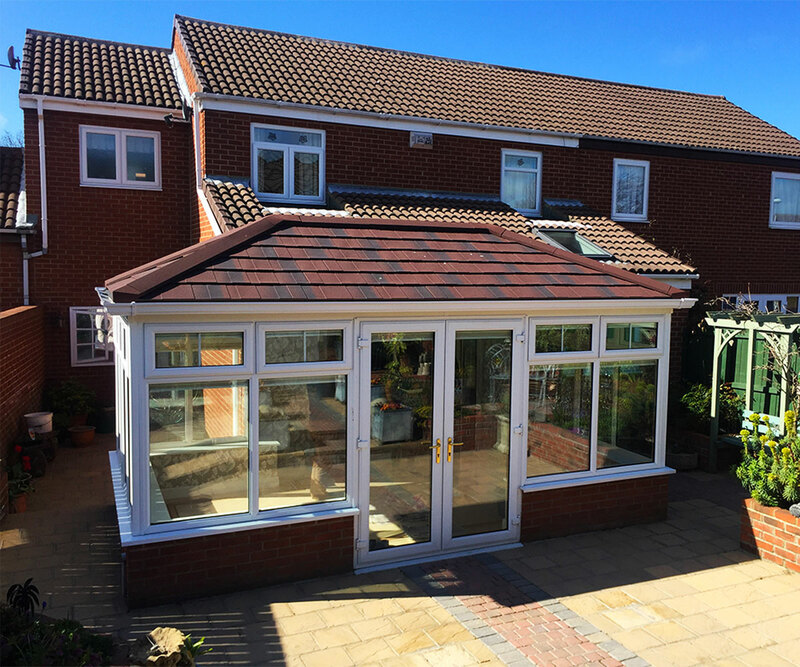 If you are looking for that contemporary or traditional look but want a solid (warm) roof for your conservatory, then Guardian’s Roof system is the ideal option; it’s currently the only patented conservatory roof replacement. Immaculate finishing options include a plaster finish, timber or uPVC cladding, and of course, optional roof windows (we highly recommend Velux windows). You will be able to choose from a range of stunning roof tiles to give your conservatory that contemporary or traditional look to match the style of your home. A Range of Roof Tiles. Choose between Antique Red, Ebony or Burnt Umber Metrotile Shingles. Metrotile steel is extremely strong and resistant, yet it is very lightweight because it’s made with Aluzinc® – galvanized steel (Cold Rolled) containing a composition of 55% Aluminium, 43.4% Zinc and 1.6% Silicium metal coating. Guardian Warm Roofs are more than a pretty face. Not only will you have a plethora of finishes and materials, but you will gain a new entity to your home – the ability to use your conservatory all year round! To find out more about your conservatory and roofing options, please get in touch with our experienced team today. You can do so by giving our showroom a call on 01932 344415 or by completing our get a quote form. Either way, we encourage you to drop by our showroom some time and view our range of roof systems for your conservatory!